A typical family visit mostly means catching up on the lives of all the family members, relatives, neighbours, etc. Don't get me wrong I love it, it's fun but, I cannot do that 24/7 on a holiday that is supposed to be relaxing. On one such occasion, I was visiting my maternal relatives in Aurangabad. After all the catching up was done, my cousin and I stepped out for a walk. Casually during our chat, he spoke about the Lonar Lake and how it has piqued the curiosity of NASA and Geological Survey of India. I was so intrigued that I begged him to take me there. About 52,000 years ago, a 2 million ton meteor that plummeted towards Earth, is believed to have hit at this spot in Lonar. The hyper-velocity impact created a 150-metre deep and 1.8-km wide bowl-shaped hole or crater. This is now the site where Lonar Lake, an unusually saline water body, is located. The Lonar Lake is Earth's largest and only salt water lake in basaltic rock. It is not just any meteorite crash site, it has triggered many questions that are beyond understanding - like why is the lake both saline and alkaline at the same time? Why doesn't the compass work here? What lies at its bottom?! Scientists across the world believe that the meteorite is still buried deep in the crater. This astronomical marvel with its dense jungle is home to rich flora and fauna. Post the monsoon season, the lake and its surrounding becomes a treat to the eyes. Numerous migratory birds flock at the lake during winter and it becomes one of the best places for bird watching. The Lonar Crater Lake is located in the Buldhana district of Maharashtra. It is around 140 km from Aurangabad, so we decided to drive up to the lake, it was a comfortable 3 hours drive. Aurangabad is well-connected by railway and roadway with major cities like Mumbai and Pune. The nearest airport is Aurangabad airport, which is 130 km away from the lake. The region gets heavy rainfall, so visiting the place in rainy season is best avoided. Summers get pretty hot, so if you are planning to go anytime between March to June, it is advisable to start early and return before the noon. Winter months of November through February are ideal to visit the lake and its surrounding. Maharashtra Tourism Development Corporation or MTDC arranges guided tours to the crater lake and also provides accommodation facilities near it. These tours usually begin at 6:30 AM. We started ours at 8 AM. Geological Survey of India has put up a board on the rim of the crater, which reads, 'The only hyper-velocity natural impact crater in basaltic rock in the world'. We then took a narrow, dirt road that seemed to be well-trodden, to the lake. There are stone steps that lead from the rim of the crater to its base. I was amazed to see several temples in and around the crater. Most of them were in ruins with creepers growing around them, but they were spectacularly beautiful. There are interesting stories and legends around these beautiful stone temples. It is said that a demon named Lonasur resided here and was slain by Lord Vishnu. There is a Daitya Sudan temple, which is dedicated to Lord Vishnu in this demon-slaying form. We visited a Shankar Ganesha temple next, which has an unconventional Shiva idol that is rectangular in shape. There are more than ten temples in and around the crater. Another interesting spot is the Dhara or Sita Nahani, which has a mysterious, perpetual freshwater stream. The stream feeds a lake situated at the temple, also known as Gomukh. Legend has it that this is the place where Goddess Sita bathed. All the temples were built with basaltic rocks and had beautiful carvings on the doors and walls. A few temples like the Lord Rama's temple is still maintained and visited by the villagers. While walking around the temple ruins, we came across beautiful peahens pecking around merrily. My cousin told me about the strange magnetic field in the area and how the compasses point to the opposite directions and, at certain places, the needle continuously swings around in circles. I was amazed at hearing that but cursed him for not carrying any compasses to show me the bizarre activity. When we finally climbed back up, I was thrilled from the visit. Soon, we started back for home, but several thoughts buzzed ceaselessly in my mind. 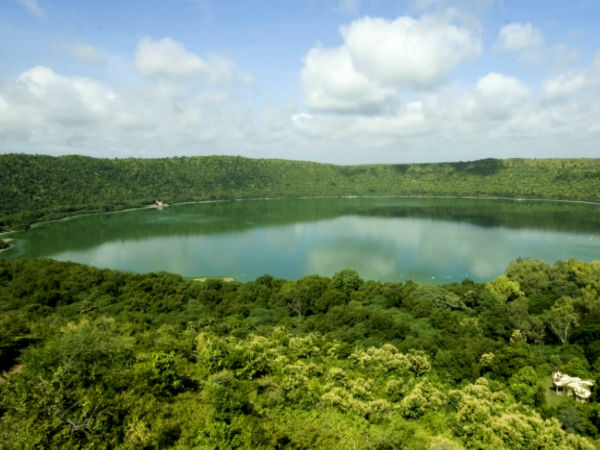 The picturesque Lonar Crater Lake is indeed a mysterious spot hiding secrets which, who knows, will ever be unearthed or remain buried under the green waters.